Consider for a minute the diversity of birds. There are nearly 10,000 species! Is it possible to trace these birds back to one common ancestor? If so, who is it? Archaeopteryx appeared in a site in Germany. scientists to try to figure out how birds were related to other creatures. 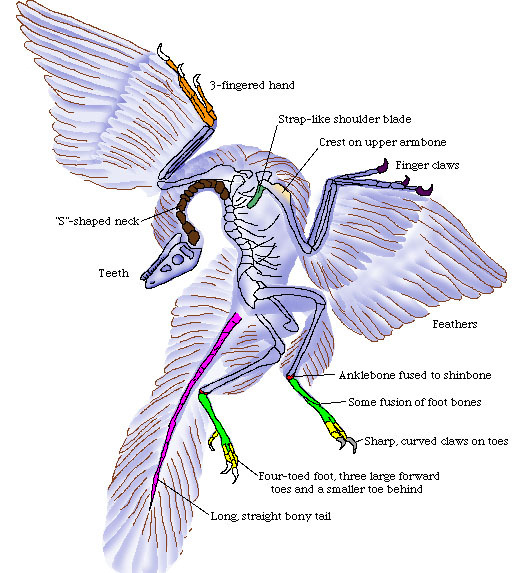 bird had features of dinosaurs AND birds. So where did birds evolve? amount of variation in this duct even among the lizards and other reptiles. using key characters we can use cladistics to understand better the relationships. and more specifically to Manirapterans. the pubis bone of the pelvis is rotating backwards and has a foot. to find fossil evidence that could link birds back to their dino-roots. in the trees could have glided from tree to tree. because every known modern semi-airborn animal (glider), seems to be arboreal. and thus evolved from the ground up. was the same movement for flight.